This post is for all those interested in our installation of the Automated Returns Sorter (as mentioned earlier). We have been very happy with the sorting to bins, however the ultimate aim with automated options is to reduce manual materials handling to a minimum (try saying that 5 times quickly!) so my ultimate hope is for the items to be automatically returned on the ILMS, sensitized and then sorted onto trolleys. Then I move to my dream of a robotic trolley that drives itself to the correct floor and sorting shelves without running anyone over and we move again into the realms of what I would do if I won Tattslotto …. Anyway in the short term we have recently purchased 2 trolleys from QLS, onto which can be loaded returned items. Simply remove the bin from the ARS, add a docking station, then hook in a trolley instead (as below). 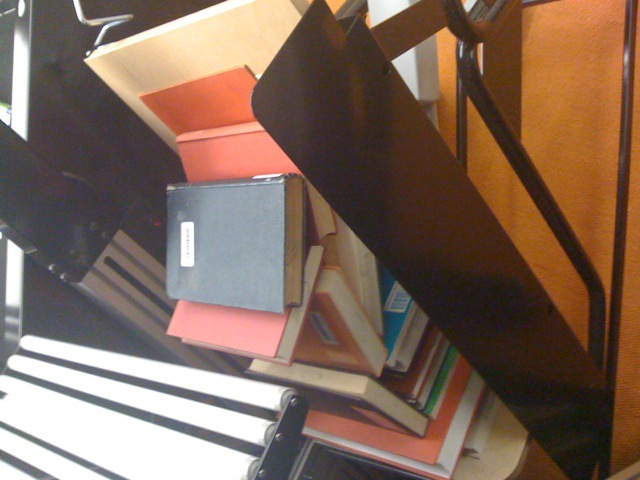 Note that books are loaded in the order returned (not presorted as Bibliotecha’s machine does), and are placed with side displayed up as returned by the student; so not always spine up (as a ARS with a turning mechanism can do for you). However the QLS machine may be a more affordable option if these items are not a priority for you. This option works well for general loads. Unfortunately after trialling the trolleys for a little while we have discovered there are 2 issues with large books. 1. NOISE – each item lands with a decided bang. You wouldn’t want to have staff in the room all the time. 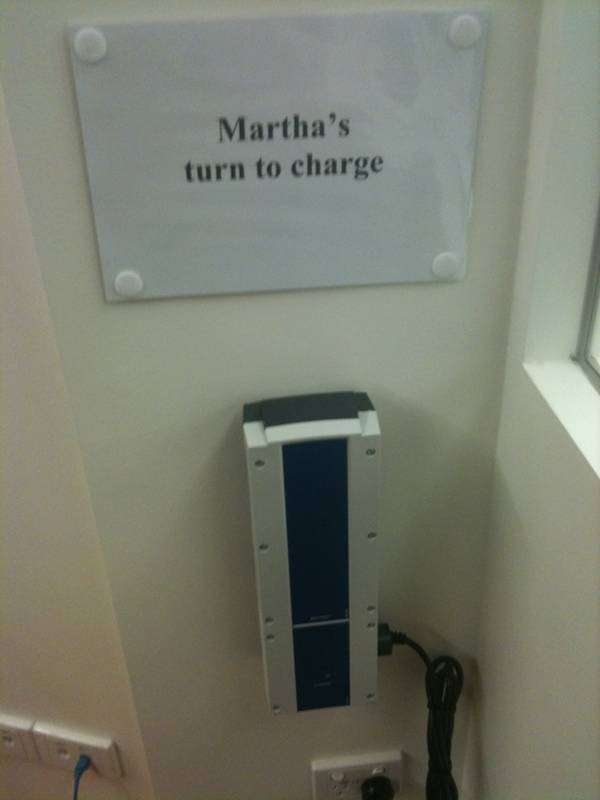 Unless they had nerves of steel … Or have the returns machine too close to public quiet reading space. 2. 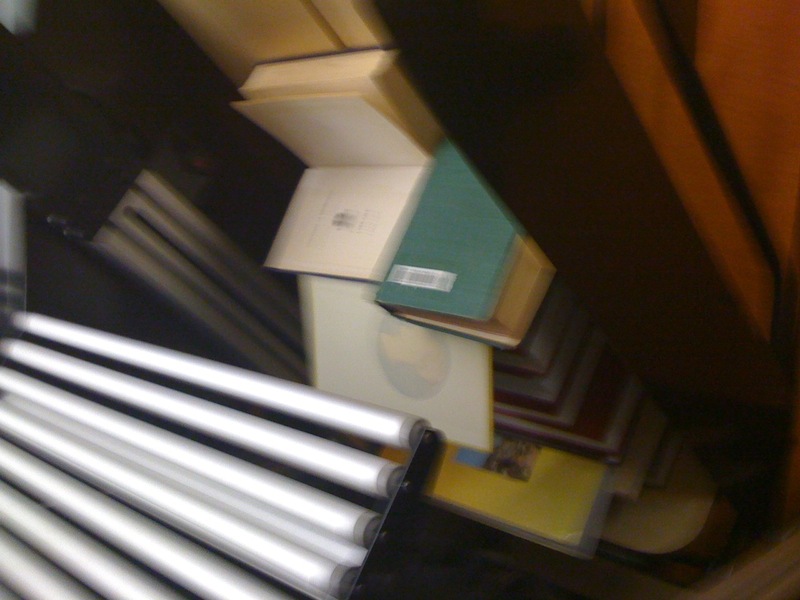 BALANCE – if a heavy book lands on some smaller books, then following some rule of physics I can’t remember, the whole collection topples and several books end up on the floor. However we are continuing with the trial for a little while to see what we can use them for.